Hello out there to all my readers! Thanks for reading my blog for so long, I really appreciate your support! There hasn’t been too much going on lately in Shaolin. June has brought exciting new fish and bugs. I spotted a Tarantula yesterday (around 7pm) but I didn’t have a net on me so I had to just dart off in the opposite direction lol! It looked kinda like a crack in the ground, only it was black and looked more like a SCARY SPIDER! 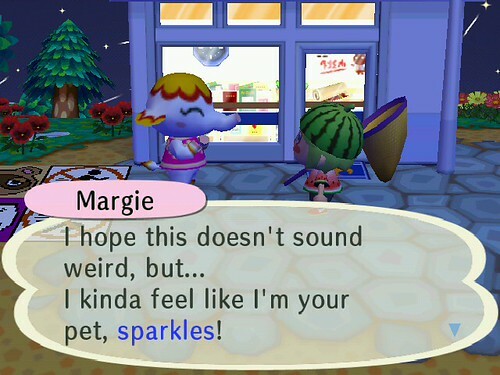 Honestly, she was saying this b/c I got rid of her fleas lol! In other news, I found myself with a ton of orange classic balloons, since recently Phineas thought it would be funny to only give me balloons I didn’t want. I had just left the orange balloons by the gate, but nobody ever wants them. So I decided to get rid of them once and for all. And no, I don’t mean by sending them to friends or neighbors. 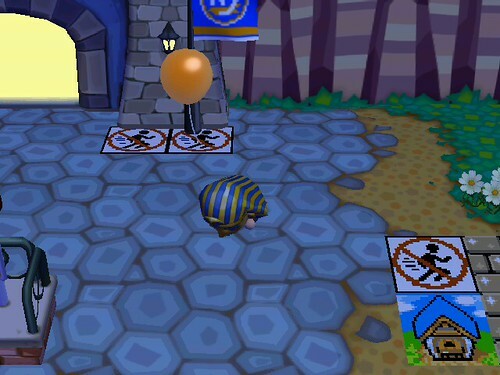 I put on my cursed King Tut mask, grabbed a balloon and started running. If you remember what Phineas says, you will lose your balloon if you take a tumble. So I decided to try it out. It worked! Now I don’t have ugly orange balloons cluttering up the place. Hooray! Anyway, I’ve been fishing a lot lately cuz there are lots of high priced fish to be caught in the summer! 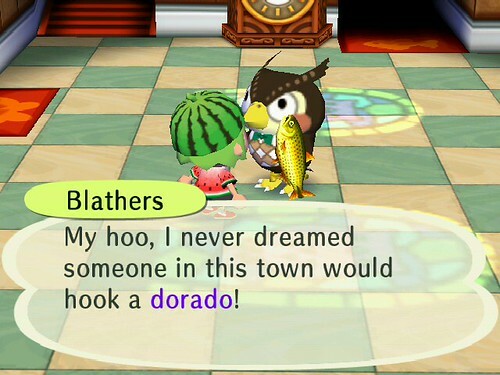 I’ve been focusing on river fish, especially the Arowana (worth 10,000 bells) and the Dorado (worth 15,000 bells). I need them both for the museum, and spares for my WALLET! I was so glad when I pulled my first golden fish out of the river! Now that I donated one, I can pocket the rest! Open question to all readers: Anyone seen Gulliver lately? I sure haven’t. I only saw the UFO one time, when I first started the game and I didn’t have a slingshot. I haven’t seen or heard about him at ALL since. So when Apollo mentioned his name, I got a little excited. Where the heck IS Gulliver?? Maybe Gulliver will show up soon. 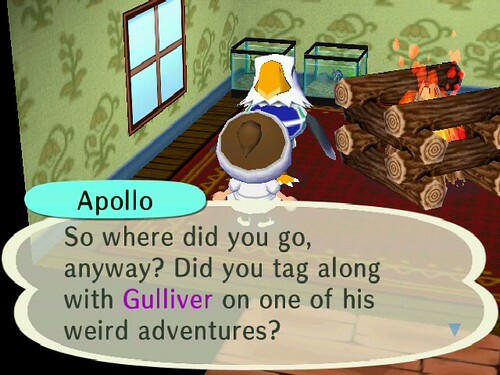 Maybe Gulliver doesn’t show up until your townies start talking about him. All I know is, I’m desperate to meet him! I met him a long time ago in Chibikuro, but I want to see him in my OWN town! 🙂 Fingers crossed! Pascal was in Shaolin today… but there’s always tomorrow! And now, finally… the big news! Shaolin has a NEW TOWNIE! Her name is Elise, and she moved to the place where Peanut’s house used to be. No important flowers were harmed during the move (thankfully!). Now, I know I’ve been asking for a monkey to move to Shaolin for a long time. So I’m very happy about that! However, Elise is very weird looking. I suppose I’ll get over it. But where are all the CUTE monkeys?? 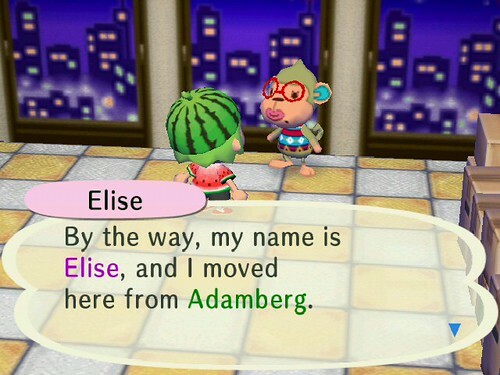 I also was excited because Elise is the first neighbor to move in, and announce that they came from another AC:CF town. But WHERE the HECK is Adamberg? I checked both Squirt and Deb’s friend lists and I didn’t see anybody registered with the town Adamberg. If anyone can shed some light on this mystery, I’d greatly appreciate it! Grats on the new neighbor. I am so excited because Gloria wants to move away! I intend to post about it…soon. I need to design a no ducks shirt. I don’t like them! Elise is a little funny looking. I’m jealous that you saw the tarantula. Do they only come out in the evening? I have been roaming around, but haven’t seen anything like that yet. I did get a birdwing finally—and a violin beetle.